If you haven’t heard of mocal yet, you soon will. This latest digital technology trend has quickly turned into a formidable force for anyone involved in the travel industry. 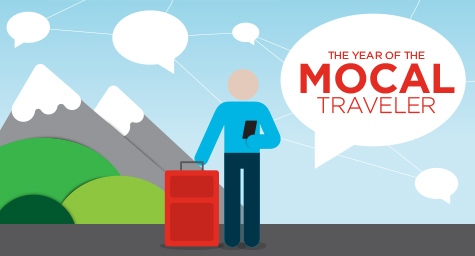 The Year of the Mocal Traveler, a complimentary new e-book from MDG Advertising, explains that mobile devices now account for 20% of all travel sales, and that 40% of all stories shared on Facebook are travel-related. Fuse these two statistics together and you get mocal. Simply put, mocal is what happens when people access social media through their mobile devices. More than just a buzzword, mocal is exerting a major influence on a growing number of travel-related purchases. And no, it’s not enough to utilize mobile and social media separately. Those who catch on and treat this powerful combination as a single marketing force will gain a decided advantage over their competitors. In this informative new e-book, MDG details how the collision of social media and mobile usage has created an explosion of opportunities in the travel industry, and why treating these two trends as a single marketing force can have a major impact on ROI. Readers will gain valuable tips and strategies for using mocal to increase bookings, build brand awareness, manage their online reputations, and more. With this highly detailed e-book, travel marketers will gain valuable insight and easy-to-employ tools to help them better understand and more effectively market to this lucrative new breed, the mocal traveler. Download The Year of the Mocal Traveler now, and feel free to share it with your friends and colleagues. Grab your share of the mocal market. Ready to discover the exciting potential of mocal and learn how you can put this powerful new motivator to work for you? We’ll take you step-by-step through the ins and outs of creating an effective mocal strategy. For more strategies on how to capture the mocal traveler for your brand, contact MDG Advertising today at 561-338-7797. MDG Advertising, a full-service advertising agency with offices in Boca Raton and New York, NY, is one of Florida’s top branding firms. MDG’s capabilities include print advertising, direct mail marketing, branding, logo design, creative, digital marketing, media buying and planning, radio and TV advertising, Web design and development, online video advertising, infographic development, email marketing, content marketing, mobile marketing, social media marketing, and SEO. For the latest trends in advertising and branding, contact MDG Advertising today at 561-338-7797.